For short-lived races like humans, space is dominated by the complicated, grandiose Mercatoria. To the Dwellers who may live billions of years, the galaxy consists of their gas-giant planets - the rest is debris. Fassin Taak is a Slow Seer privileged to work with the Dwellers of the gas-giant Nasqueron. His work consists of rummaging for data in their vast, disorganised memories and libraries. Unfortunately, without knowing it, he's come close to an ancient secret of unimaginable importance. The Culture is a magnificent and enticing vision. Eighteen-year-old Kit is weird: big, strange, odd, socially disabled, on a spectrum that stretches from "highly gifted" at one end, to "nutter" at the other. At least Kit knows who his father is; he and Guy live together in a decaying country house on the unstable brink of a vast quarry. His mother's identity is another matter. Now, though, his father's dying, and old friends are gathering for one last time. A man lies in a coma after a near-fatal accident. His body broken, his memory vanished, he finds himself in the surreal world of the bridge - a world free of the usual constraints of time and space, a world where dream and fantasy, past and future, fuse. Who is this man? Where is he? Is he more dead than alive? Or has he never been so alive before? The first book in the landmark Expanse series, now a major television series! Leviathan Wakes is James S. A. Corey's first novel in the epic New York Times best-selling series The Expanse, a modern masterwork of science fiction in which humanity has colonized the solar system. In the world of Gnomon, citizens are constantly observed and democracy has reached a pinnacle of "transparency". Every action is seen, every word is recorded, and the System has access to its citizens' thoughts and memories - all in the name of providing the safest society in history. When suspected dissident Diana Hunter dies in government custody, it marks the first time a citizen has been killed during an interrogation. The System doesn't make mistakes, but something isn't right about the circumstances surrounding Hunter's death. Her eyes were black, wide as though with some sustained surprise, the skin from their outer corners to her small ears taut. Her lips were pale, and nearly too full for her small mouth, like something bled but bruised. He had never seen anyone or anything quite so beautiful in his life. Graham Park is in love. But Sara Fitch is an enigma to him, a creature of almost perverse mystery. Steven Grout is paranoid - and with justice. He knows that They are out to get him. A Fire Upon the Deep is the big, breakout book that fulfills the promise of Vinge's career to date: a gripping tale of galactic war told on a cosmic scale. Thousands of years hence, many races inhabit a universe where a mind's potential is determined by its location in space, from superintelligent entities in the Transcend, to the limited minds of the Unthinking Depths, where only simple creatures and technology can function. What a wild, wacky, awesome book! It is 30 years from now, and we have colonized the moon. American Fred Fredericks is making his first trip, his purpose to install a communications system for China's Lunar Science Foundation. But hours after his arrival, he witnesses a murder and is forced into hiding. It is also the first visit for celebrity travel reporter Ta Shu. He has contacts and influence, but he, too, will find the moon can be a perilous place for any traveler. There is a world that hangs suspended between triumph and catastrophe, between the dismantling of the Wall and the fall of the Twin Towers, frozen in the shadow of suicide terrorism and global financial collapse. Such a world requires a firm hand and a guiding light. But does it need the Concern: an all-powerful organization with a malevolent presiding genius, pervasive influence and numberless invisible operatives in possession of extraordinary powers? Among those operatives are Temudjin Oh, of mysterious Mongolian origins, an un-killable assassin who journeys between the peaks of Nepal, a version of Victorian London, and the dark palaces of Venice under snow; Adrian Cubbish, a restlessly greedy City trader; and a nameless, faceless state-sponsored torturer known only as the Philosopher, who moves between time zones with sinister ease. Then there are those who question the Concern: the bandit queen Mrs. Mulverhill, roaming the worlds recruiting rebels to her side; and Patient 8262, under sedation and feigning madness in a forgotten hospital ward, in hiding from a dirty past. There is a world that needs help - but whether it needs the Concern is a different matter. Banks' ideas and characters are inspired. His plots are improved with a second reading (listening), when you recognize details and have insights into the secrets of his fascinating characters. Transition weaves the stories of six people through time and alternate dimensions. Among them a despotic bureaucrat and her moralistically superior outlaw rival, a narcissistic stock broker, a torturer, and the transitioner -- a sympathetic assassin who can "flit" his consciousness into another body in another dimension. Banks explores this cool concept in depth. The narrator is fantastic. I'm going to look for other books read by him. There are scenes in this book, like most of Banks' books, that are very harsh. The torturer's story, for example, is hard to listen to at times. This is definitely not a book for kids. Highly recommended. If you enjoy books like Snow Crash, William Gibson, etc., then you'll probably like it a lot. 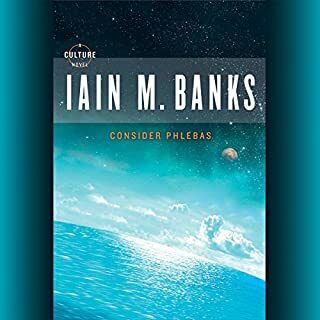 I'm so grateful to Iain M. Banks for writing yet another complex, moving, intelligent and well told story and for Peter Kenny for doing such a wonderful job narrating it. Transition is a book worthy of the this same science fiction author who wrong "Look to Windward" and the "Algebraist". Please be aware that Iain M. Banks tends to write very richly crafted villains as well as heroes, so if you're squeamish he's not for you. I'm not squeamish, of course, and love his style. 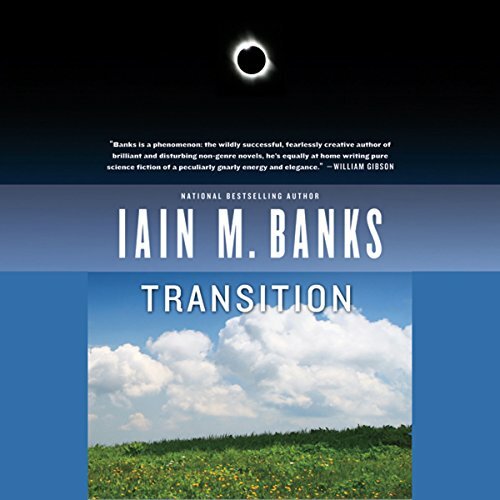 Finally, part of what makes Transition so rich is that it ties itself obliquely yet solidly to problems we face in our world, and he lets us make judgements for ourselves without telling us what to think. This is a great book. 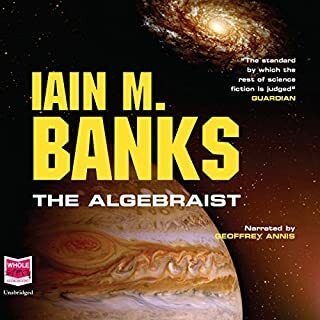 I'm a huge Iain M Banks fan, and this book has been my favorite listen on audible so far. If only there were more of his books here. Please please please add some from the Culture Universe. 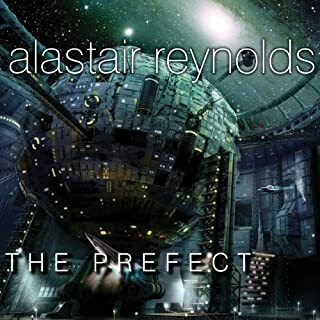 Banks writes complex, thoughtful and challenging sci-fi.... exploring themes in which morality is curved, good and evil are never quite straightforward and the narration can be interestingly non linear. If you like your protagonists to be sometimes flawed while always interesting, and your antagonists sometimes sympathetic yet always vile. Take a ride with Banks. Peter Kenny's narration is superlative. Many readers could easily subtract from the genius of Banks' writing. I found it difficult to imagine anyone adding to it, but Kenny does so, bringing the subtleties of the characters out quite beautifully with his range of voice and accent. Brilliant. A good read (listen). Banks never fails to surprise. 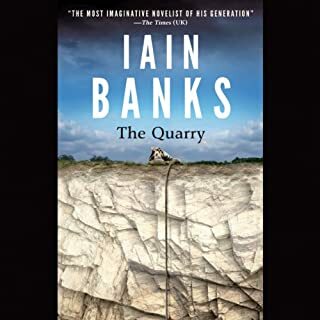 Peter Kenny brings the story to life Banks has a number of other SF books available from Audible in the UK. Why not here? Stunning book. It takes some concerntration, as do all Iain Bank's book, but it is well worth the effort. One of the the most innovative writers. More please! Took some time for the story to unfold--as is often the case with Banks' books. But he is one of my top 5 favorite authors and I knew it was worth being patient and allowing the story to unfold. I was not disappointed. This is a great story. The narrator is fantastic. 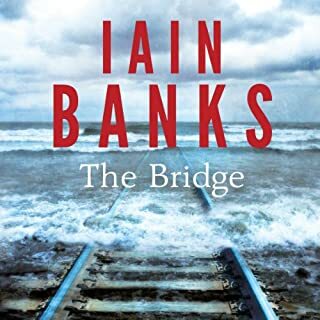 How I wish there were more Iain Banks novels on Audible. I loved this book. Five stars! It was confusing at first (but in an interesting way,) but became more clear as it went on. Banks is the most wildly creative writer I've "read" in ages. I just wish I could get all his work here. Much to my annoyance some of his audio books are available in England though not here. Banks is a master of literary, idea-driven science fiction. Transition jumps around between characters, times, and alternate universes, and still winds up being a straightforward story. Beautiful. 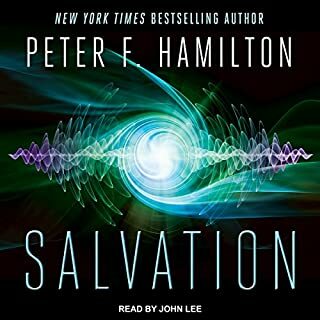 And Peter Kenny is probably the best narrator I've come across in an audiobook. Flawless voice work and a perfect fit with the intelligent writing. Would you try another book from Iain M. Banks and/or Peter Kenny? This is not a Culture novel. I mistakenly thought it was. I love Banks and I love Peter Kenny's narration. I haven't read a multiple worlds novel that really satisfied me. It all seems a bit too easy. In this novel, you have a secretive high-control organization that acts as the gateway to the multiple earths. In the end, the motivation of the organization and it's tyrannical leader remain a bit unclear in an unsatisfying way. Have you listened to any of Peter Kenny’s other performances before? How does this one compare? Do you think Transition needs a follow-up book? Why or why not? Alas, Iain Banks has passed away. Yes, this novel begs for a follow-up, but I don't see it happening.